The Somali was first accepted for competition by CFA in the 1979-80 show season. At that time, only the ruddy and red colors were accepted. The blue was later accepted in 1986, and the fawn in 1990. 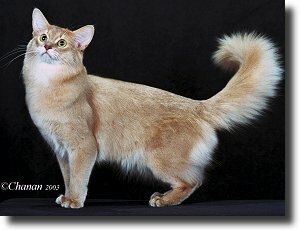 The ruddy Somali has ground color that is burnt-sienna, ticked with various shades of darker brown or black. The underside of the body and insides of the legs are an even ruddy color, harmonizing with the ground color. 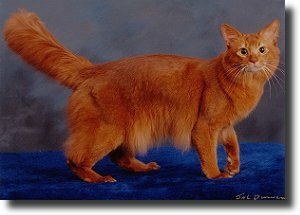 The red Somali has ground color that is a rich red, ticked with various shades of chocolate brown. The underside of the body and insides of the legs are an even red color, harmonizing with the ground color. 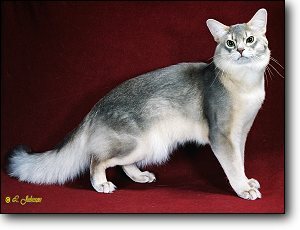 The blue Somali has ground color that is warm beige, ticked with various shades of slate blue. The underside of the body and insides of the legs are an even peach/apricot color, harmonizing with the ground color. 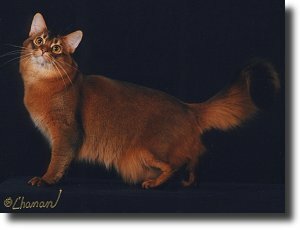 The fawn Somali has ground color that is warm rose-beige, ticked with various shades of light cocoa brown. The underside of the body and insides of the legs are an even cream color, harmonizing with the ground color.